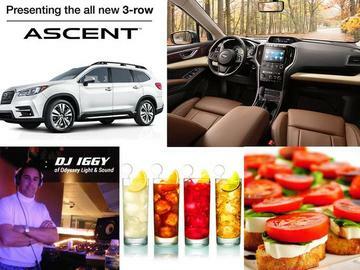 You're Invited to an Evening of Ascention featuring the All-New 2019 Ascent! We want to take you to the highest mountain tops as Subaru of Pembroke Pines invites an exclusive list of it's Subaru customers for an private event with smoothing vibes provided by DJ Iggy of Odyssey Light & Sound, complimentary hors d'oeuvres, food station and refreshments, a walk-around presentation of the Ascent with Q & A's and of course; test drives! This is a FREE EVENT. Kindly RSVP by August 8th. Everyone that RSVPs on or before the 8th of August will receive an additional $500, non-expiring certificate towards a new ascent.